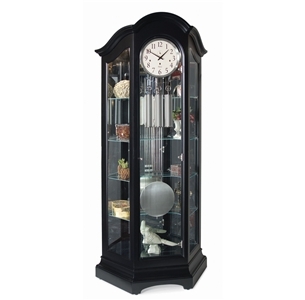 The Decorah curio clock exemplifies how function and form can work together in beautiful harmony. From the full length side glass, gracefully arched bonnet top, and abundant curio space, this jewel sets the standard to which others will strive to reach. Finished in Ebony Luster over select hardwoods and veneers, the Decorah features a large 300mm round dial frame with Arabic numerals, brushed nickel weight shells and pendulum, and Ridgeway’s exclusive Dual Touch Lamp lighting. Four large adjustable shelves and one fixed shelf offer the convenience to display all of your treasured collectibles.